This is the sixth article from 中文天天读. “但是” is a conjunction that indicates “transition”. But, in Asian countries, people are still not accustomed to hugs. 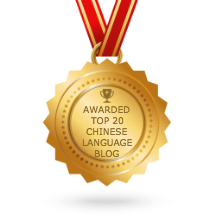 “习惯” can be used as a verb, with the meaning of “form certain habit or custom”. When used as a noun, it refers to the habit or the custom formed. Likewise, hugging is not a Chinese custom either. Hugging – not a Chinese custom. In your country, is it customary to hug? In many Western countries, when people see each other, they often hug. In many other countries you can also see people hugging. But in Asian countries people are still not very accustomed to hugging. Equally, in China it’s not customary to hug. In China, families, partners and good friends may hug each other. In China, the way to express friendship is often to shake hands and nod. People who aren’t so familiar with each other, who have just gotten to know each other, when they see each other often shake hands. When shaking hands, they should make eye contact. They should smile at the same time as shaking hands. When friends meet, often they just nod a little. Between people who know each other well, they will smile and nod. Between people who know each other well, they will smile and nod. I think it should be “do not now each other well”. Hi Min Min, thanks for the feedback and the correction. This is a really great resource and the effort that is put in is impressive. Thank you! In your country, do people have the habit of embracing each other? In many Western countries, when people meet, they often hug each other. In many other countries, you can also often see people embrace each other. But in Asian countries, people are not comfortable with hugs. Similarly, Chinese people also do not have the habit of hugging. In China, family, only lovers and good friends will embrace one another. Chinese people’s way of expressing their feeling towards good friends is always shaking hands and noding the head. When meeting people whom you are not familiar with or just meet, the handshake is often the practice. When shaking hands, you look at the other person’s eyes, then smile and shake hands at the same time.. Friends only nod their heads when they meet. People who do not know each other well can also smile and nod. Good. Thanks for your translation. Your audio download results in a 404 error message. I have uploaded the zip file. Please try again. 我知道行的发音可以是 xíng 或 háng 但是它的意思不一样对不对? That’s right! Most Asian people are not very comfortable about hug, they are more comfortable about hand shake.